Kilim rugs are enjoying a revival of popularity throughout the world today. Although no one knows precisely when and where the technique of weaving first started, there is no doubt that the weaving art, in general, started in Central Asia. A popular explosion forced the inhabitants of that area to migrate to the western parts of Asia in order to find more prosperous land. These migrating tribes were called yoruks or nomadic tribes. During their migrations, these nomads, who were exposed to severe weather conditions, learned to use goat hair in the making of their tents. Goat hair is longer and much stiffer than sheep's wool. The flat-weave technique was used in the making of nomadic tents. Just as with a little girl's braided pony-tail where strands of the shorter and stiffer hair stick out, the goat hair sticks out of the woven fabric, gets wet, drops and partially cover the holes in the flatweave, thus making tent almost waterproof. Later on, these nomadic people felt the need to isolate themselves from the humidity present in the earthen floors of their tents. They then applied the very same techniques of flatweave to the making of of floor coverings and called them "Kilims". Since this was the area of paganism, most flatweave designs reflected stylized depictions of the worshipped symbols. Kilim rugs is a tapestry rug woven from fairly harsh, thick wool. Kilim artistry is high compared to the price and there is a fantastic variety of Kilim designs. The best prices for kilims are often in long narrow strips rather than room size kilims. As a flatweave kilims are arguably not as practical as some other rugs and have a tendency to pucker up. Kilim rugs are made by nomadic peoples in Turkey, Iran, Iraq, Russia, China, Pakistan, India and Morocco. Kilims were originally intended as a pliable warm carpet that could be placed on a sandy desert floor and easily packed on a came or horse. Kilim designs represent different tribes and regions. Kurdish kilims are brighter, sometimes mixed with embroidery, and generally cheaper. Turkish kilims feature Mediterranean colors of gold orange and turquoise. Iranian kilims are grounded in burgundy, rust, heavy blues and heavy greens. 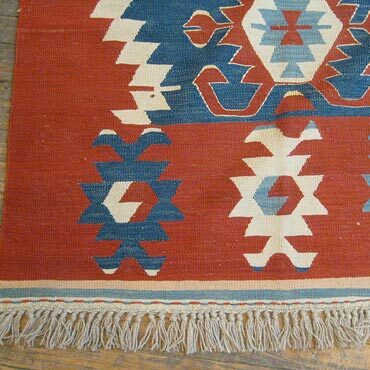 Most kilims are reversible, but rarer Kilims have loose ends on the back. Kilims are becoming increasingly valuable.